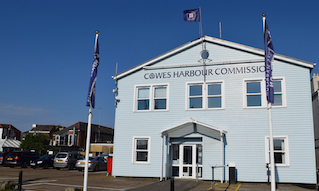 The Cowes Harbour Services Boatyard site is easily accessed from Kingston Road in East Cowes, a two minute drive or 10 minute walk from the Chain Ferry in East Cowes. Approaching from the water, Kingston Wharf is just to the south of East Cowes Marina. Our buildings are easy to see from the River Medina; they lie just in front of the two imposing power station chimneys and have "Cowes Harbour Commission - Kingston Marine Services" in large letters across the front. On arrival by boat, we have limited availability of waiting pontoons and by road, car parking is available. The road gates are closed outside normal working hours and a code is required for access. On arrival by either method, please let us know you are here, whether by finding us in the yard or the part time reception, marked on the map.